Kurzweil 3000 Firefly: This is more than a screen reader; it can help your child organize their notes and makes finding specific passages easier. Evernote: An innovative way to organize materials, it can create compilations of notes, images, recordings and more. We live in a world full of technology, and it can be both to our advantage and disadvantage. 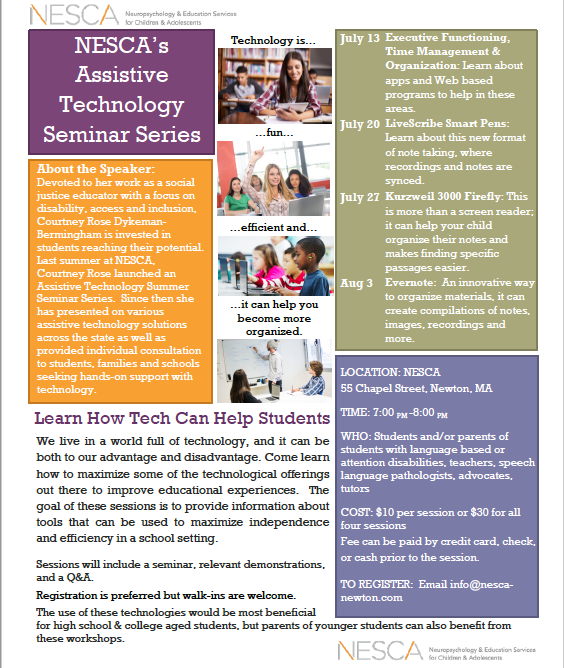 Come learn how to maximize some of the technological offerings out there to improve educational experiences. The goal of these sessions is to provide information about tools that can be used to maximize independence and efficiency in a school setting. Sessions will include a seminar, relevant demonstrations, and a Q&A. Registration is preferred but walk-ins are welcome. The use of these technologies would be most beneficial for high school & college aged students, but parents of younger students can also benefit from these workshops. Fee can be paid by credit card, check, or cash prior to the session. Devoted to her work as a social justice educator with a focus on disability, access and inclusion, Courtney Rose Dykeman-Bermingham is invested in students reaching their potential. 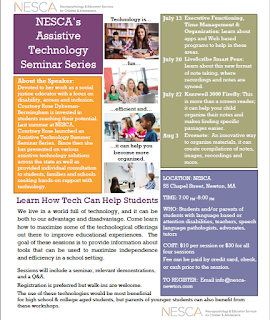 Last summer at NESCA, Courtney Rose launched an Assistive Technology Summer Seminar Series. Since then she has presented on various assistive technology solutions across the state as well as provided individual consultation to students, families and schools seeking hands-on support with technology. If you missed a previous seminar you can schedule a tutorial to go over missed material!